If there’s anything that the TrueLogic family is good at, it’s – well – everything! 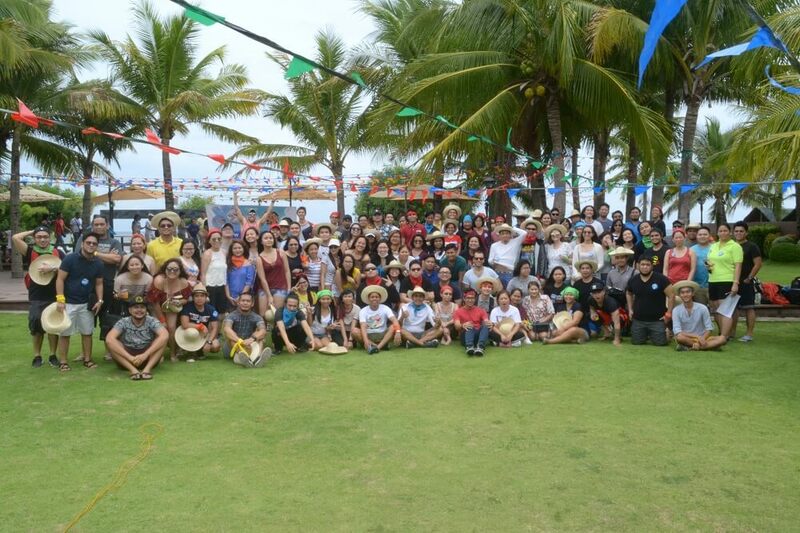 Last June 10 to June 11, 2017, the company hung their SEO hats for two days and took a five-hour drive to Hotel Brizo Resort, Bataan. Other than digital marketing professionals, we never knew we had a slew of musicians, rappers, bartenders, sports mavens, quick-witted Jenga players, karaoke kings and queens, and even a dodgeball whiz with superhuman moves straight out of The Matrix. The company outing was a display of skills, talent, and individuality like no other. 5AM might have been too early for the night owls, but the team was as vibrant as always in the assembly area at Dela Rosa Access Road 2. After a long ride up north and a few hours of peaceful sleep on the bus, TrueLogic was more than ready for a breather. Upon arrival at the venue, host Chewy Buhion called the shots and split the company into five teams: Yellow, Green, Red, Blue, and Orange. And the fun commenced! We take every game seriously, even ice breakers. 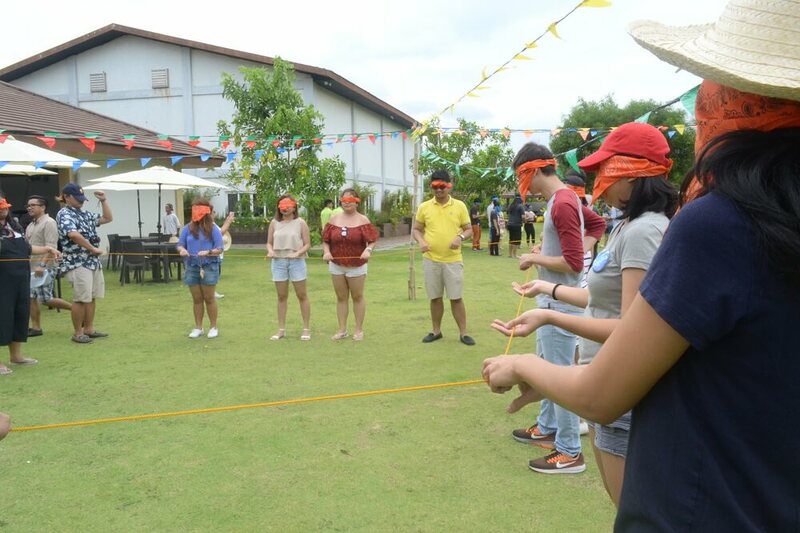 For the Perfect Square activity, all the members of each team were tasked to form a square with blindfolds on – the team with the best square wins. This urged people to strategize as a team while working together without their sense of sight. Despite the great efforts from all teams, the Blue Team won this round. 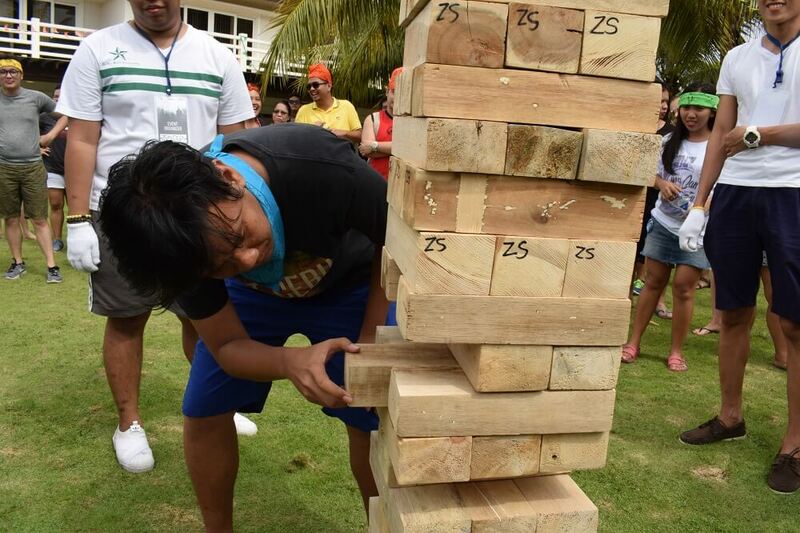 The second activity for the day was Giant Jenga. The Jenga tower was placed in the middle of the field and a member from each team took turns pulling out blocks from the tower. The rules were the same as the original game, just on a bigger scale. After several rounds, it was down to the Green Team and Yellow Team. But the game ended when the tower toppled during Green Team’s turn. The Yellow Team won! This is where it gets tricky. The organizers set up the platform and scattered half-filled plastic cups with colored plastic balls on top. It was a confusing arrangement but when Chewy called it a minefield, everything made sense. 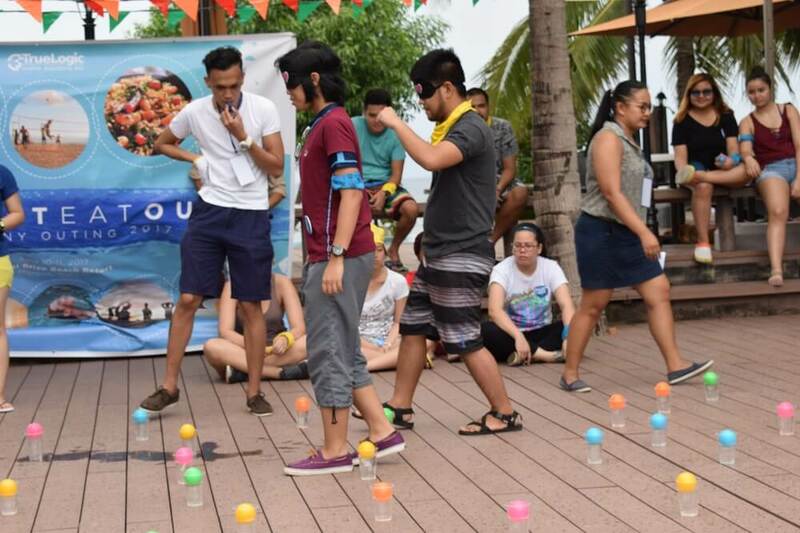 While wearing blindfolds, a member of the team has to make it from one point to the other through the guidance of their team leader’s voice without stomping on any of the plastic cups. Each team’s tactic was unique and team leaders had their own ways of giving directions – it was a treat to watch. Amongst all the teams, the Red Team had the most members across the platform, securing their win. The hardest activity of all was the Bucket Game. 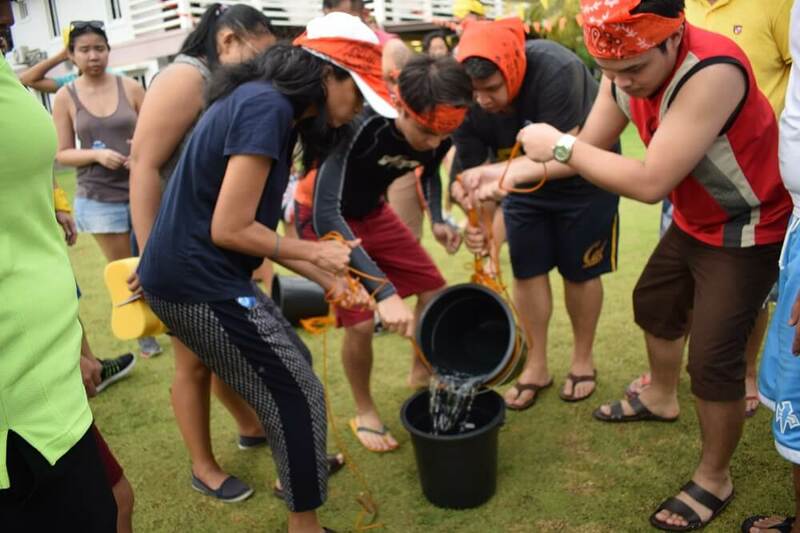 Five members of the team had to soak a sponge with pool water and fill up their team’s buckets. Five others were in charge of tying the bucket with a rope while another five members had to lift the bucket and pour the contents onto another bucket (a little complicated, we know). The team with the most water in their final bucket wins. Although the Green Team was the first to fill their buckets, the Blue Team was the true victor. 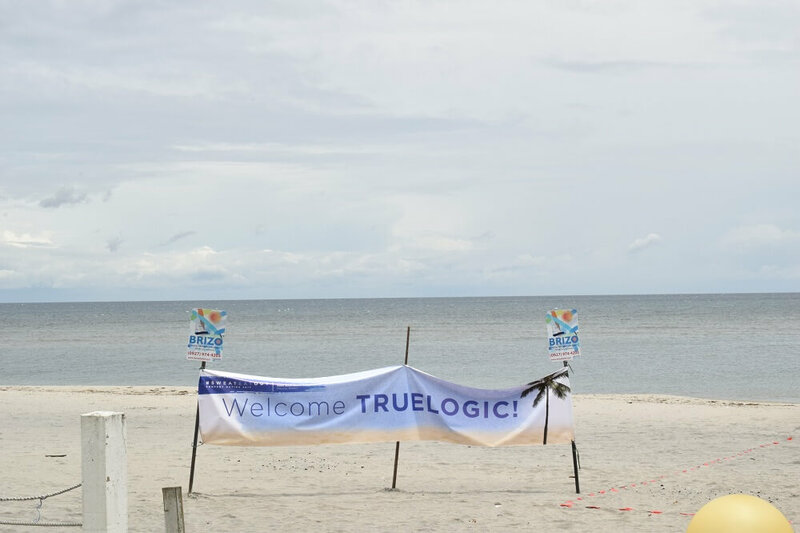 TrueLogic moved to the beach for a wild game of dodgeball. At this point, the rain poured but that did not dampen our competitive spirits. The dodgeball games were a cinematic treat. John Pangan from the Content Team dominated the field and impressed the crowd with the tricks of the trade and Neo-esque moves. Chill Repedro outdid his other teammates as well in the later rounds. But in the end, the Blue Team triumphed. Before the Night Socials started, CEO Itamar announced the overall winners for the day’s team building activities. In 3rd Place was the Red Team with a prize of Php7,000. 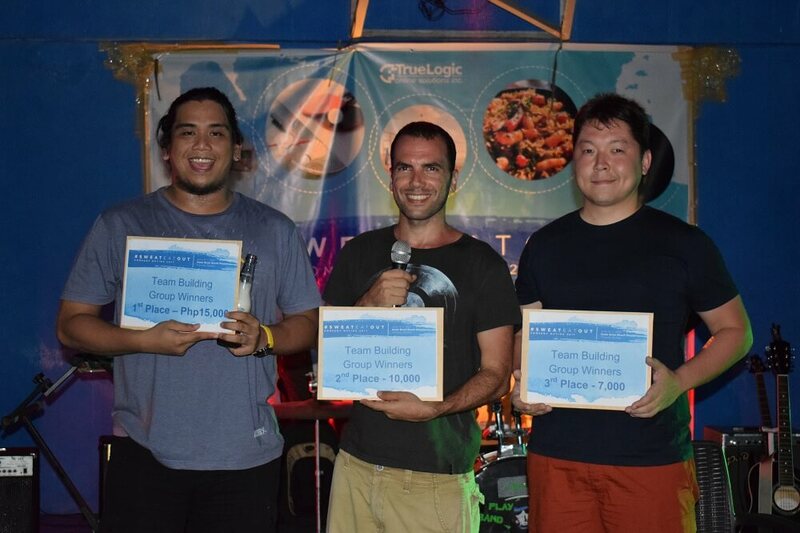 Coming in on 2nd place was Itamar’s team, winning Php10,000. The crowd went wild for the frontrunners: the Blue Team. Itamar handed the champions a grand total of Php15,000 for their victorious win. Chewy again hosted the Night Socials and some Truelogic employees played a round of drinking games to set the mood. 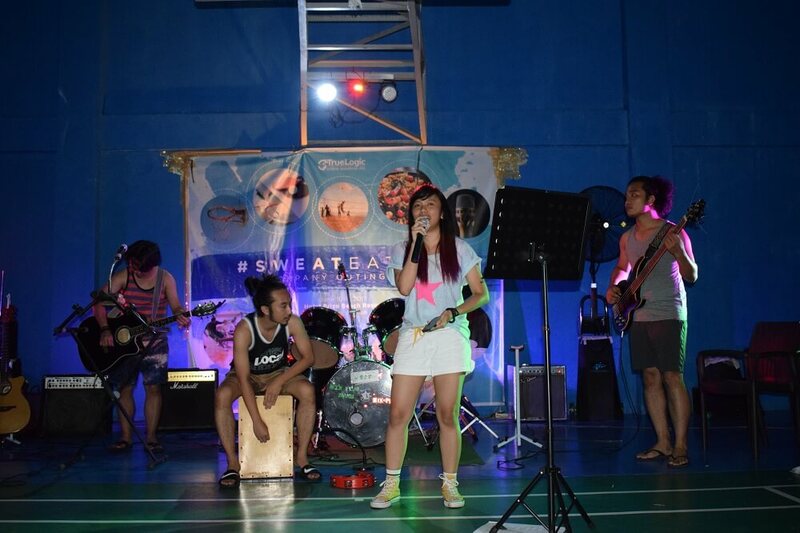 It was TrueLogic’s own band No Index (Jentri Fule, Shaw Morales, Tim Bienvenida, Pocholo Torres) that truly lit up the night. The night is never lonely with friends, tunes to sing, and a few (or many) drinks. For the #TrueIdols jamming session, there were special performances headed by our very own Itamar who jammed by playing the guitar and the drums. There were also powerful performances from Jayson, CJ, Jill, Kat, Jigger, Berns, Ina and Dale and many others that completed the night. We have such a talented bunch of people. 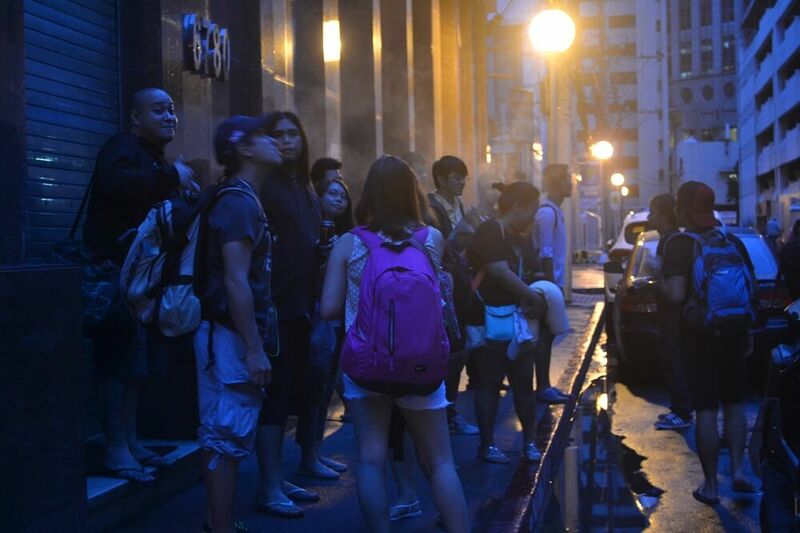 After #TrueSessions, the last people standing huddled by the Karaoke machine and sang the night away. At TrueLogic, we never say no to a game. 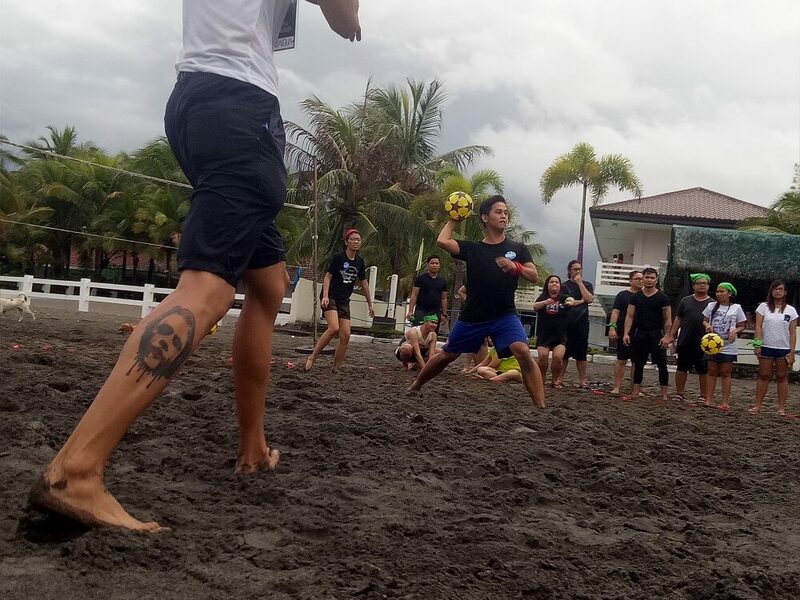 On the last morning in Bataan, there were basketball and volleyball tournaments, as well as friendly rounds of badminton and table tennis. 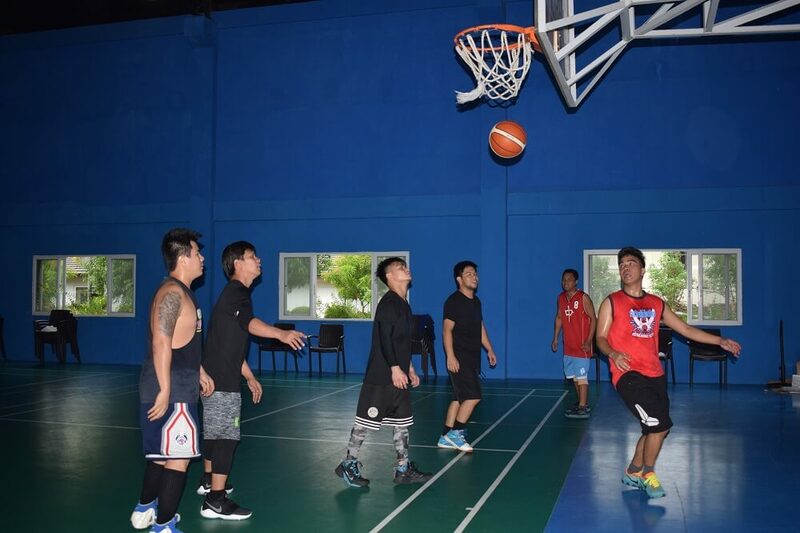 Never mind that some players are still having some kind of hang-over, they just went on to play all for the sake of sportsmanship and camaraderie. Other than the fun of it, #SweatEatOut2017 reminded the team how wonderful it is to be working alongside individuals who are not only dedicated to their work, but who are also passionate and competitive outside of their day jobs. Nothing beats working and playing with a family. ‘Til next year, team! As a Literature graduate and a writer by profession, Kat breathes the written word. On some days, you will see her dancing by karaoke machines or stealing tea bags from buffet tables. On most days, she's just asleep.